Bay colt, 1898 - 1917. William the Third was the last great racing son of the mighty St. Simon and the last champion campaigned by the Duke of Portland. William the Third was one of the best distance performers of his era, but he was no plodder. To achieve his victories, he would produce an electrifying turn of foot to carry him past his rivals. At stud, William the Third proved he was not just a one dimensional horse, for he sired winners of the classic one mile Guineas races in both England and France, as well as a winner of the Ascot Gold Cup. William the Third was bred and raced by William Cavendish-Bentinck, the 6th Duke of Portland. From the early 1880s until just after the turn of the century, the Duke enjoyed an unparalleled run of good fortune upon the turf. He purchased a chubby yearling by Galopin out of the King Tom mare St. Angela from the dispersal sale of Prince Batthyany, and wound up with St. Simon, one of the greatest racecourse performers and stallions of the last half of the nineteenth century. The Duke campaigned classic winners Ayrshire, Donovan, Mrs. Butterwick, Amiable, and La Roche, the four last-named being by St. Simon. The Duke seemed to have extraordinary luck in obtaining cheap mares and getting classic winners from them. Miss Middlewick was an unraced mare who produced Mrs. Butterwick, Miss Mildred was winless and went on to produce La Roche. Then there were the full sisters Tact and Gravity. The only thing to recommend them was the fact that their full sister Florence had won the Cambridgeshire Handicap, and then had gone to Germany and landed the Grosser Preis von Baden. These sisters were by stakes-placed Wisdom out of Enigma, by The Rake. The family traced to Atalanta, ancestress of classic winners Crucifix, Grey Momus, Industry, Destiny, and Margrave. However, the family had seemingly fallen on hard times, for until the emergence of Florence, it had not produced a high class stakes winner for many years. Tact and Gravity were each winless. From Tact, the Duke got a bay St. Simon filly named Amiable who went on to capture the One Thousand Guineas and Oaks. Gravity took a more circuitous route to get to the broodmare paddocks at Woodhouse Hall, the Duke's broodmare facility, located a little over a mile from Welbeck. Bred in Shropshire by a farmer named Hoole, her racing career had been singularly unsuccessful. She went through several different owners before the Duke decided to try his luck with her. He had her covered by St. Simon. The result, a big, lengthy bay colt, was born at Woodhouse Hall in the spring of 1898 and given the name William the Third. William the Third was sent to trainer John Porter at Kingsclere, who, upon inspecting the colt, observed immediately that he would need time to mature. Consequently, William the Third was not tried until June, when in a trial with three other stablemates, he came in third. Another trial three months later saw improvement, as he beat his stablemates. He was started in the five furlong Clearwell Stakes, but still being backward, finished unplaced. William the Third was then rested until the spring. Re-appearing in the Wood Ditton Stakes at Newmarket, William the Third displayed much improved form, winning the race by six lengths. Less than a week later, the colt took the Esher Stakes, over 1-1/8 miles, in a canter by six lengths. He graduated from there to the 1-1/4 mile Newmarket Stakes, which he won convincingly from Doricles, the latter coming off a second place finish in the Two Thousand Guineas. It was decided that William the Third had showed enough improvement to try his luck in the Derby. He very nearly pulled off the victory, losing by only a three quarters of a length to the William Collins Whitney-owned Volodyovski. William the Third did not run in the St. Leger. Doricles won the race over Volodyovski. Since William the Third had beaten Doricles earlier in the season, it put him right in the mix with the best of his generation. The Duke of Portland's colt next captured the Hurst Park Lennox Stakes and walked over for the September Stakes. He was surprisingly defeated in his last race of the season, the 1-1/2 mile Kempton Park Stakes, running unplaced to Epsom Lad, Santoi, and Volodyovski. The four-year-old season of William the Third marked him as a stayer of extraordinary ability. He had rounded out into a truly magnificent specimen. John Huby, stud manager for the Duke of Portland, reminisced about William the Third, "...in color a hard bay, he showed superb quality without an ounce of lumber anywhere. He had a beautiful and intelligent looking head, which was perfectly set on to his finely arched neck. His shoulders were splendidly placed, while his hard looking legs could not have been improved upon. He stood exactly 16 hands, and was a lengthier horse than most of the sons of St. Simon. A more docile-tempered horse it would be impossible to find, and yet he was full of courage." William the Third's first race of the season came in the Ascot Gold Cup. For the first 1-3/4 miles, he loped along in last place. Then, in a run of three furlongs, he swept by the competition and drew off to win by a commanding five lengths. Volodyovski was unplaced. Following the race, William the Third displayed some of the mellow temperament he was noted for. Being led away, he draped his head over his lad's shoulder and nibbled at a rewarding lump of sugar. Hardly something expected of a son of the fiery St. Simon. The following day, William the Third was on the course for the three mile Alexandra Plate. Carrying 9 stone 10, or 136 pounds, he won in a canter by six lengths. An emphatic eight length victory in the Doncaster Cup followed. William the Third then enjoyed a walkover for the Lowther Stakes. Competing at only 1-1/2 miles for the Limekiln Stakes, it made no difference. William the Third took the race by two lengths. He closed out the season with another unexpected defeat, this time losing by a length to Black Sand in the 2-2/4 mile Jockey Club Cup. The Duke surmised that the colt may have lost his form due to changing his coat for the winter, since he had suffered his last defeat at roughly the same time the year previous. William the Third was kept in training with the goal of winning the Ascot Gold Cup a second year in a row. Unfortunately, he stepped on a rock while being exercised and split a pastern. He was thus retired to stud at Welbeck, joining his elderly sire St. Simon and Australian champion Carbine in the stallion barn. Though William the Third was no St. Simon as a stallion, he was nonetheless a successful sire. In his first crop came the filly ARDENTRIVE. Out of the Martagon mare View, Ardentrive placed in several major stakes, including seconds in the Champagne Stakes, Rous Memorial, and Champion Stakes and thirds in the One Thousand Guineas, Coronation Stakes, and Park Hill Stakes. Sent as a broodmare to Hungary, she founded a family which over the next several generations produced Nem Igaz, winner of both the Magyar and Osterreisches Derbies and Preis der Diana winner Diu. Winkipop RONDE de NUIT was a daughter of William the Third bred and raced in France. She was out of the Stuart mare Halte-La. She scored victories in eight stakes, including the Poule d'Essai des Pouliches, Prix Vermeille, and Prix du Prince d'Orange. 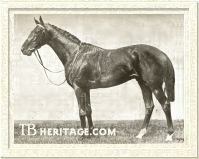 WILLONYX, foaled in 1907 from the Gallinule mare Tribonyx, was a winner in 1911 of the Ascot Gold Cup. His victories also included the Chester Cup, Cesarewitch Stakes, Ascot Stakes, and Jockey Club Cup. His most important offspring from a breeding standpoint was his son Bobolink, out of classic winner Chelandry. Winless on the track, Bobolink was imported to Claiborne Farm near Paris, Kentucky by Arthur Hancock. There he sired champion colt St. James, sire of stakes winner and major sire Jamestown. The male line kept going, for Jamestown's son Johnstown won the Kentucky Derby and Belmont Stakes and became a noted sire. William the Third was bred several times to the Juggler mare Conjure and got three important offspring: Winkipop, Winkie, and Third Trick. The best of these from a racing standpoint was the filly WINKIPOP. She was foaled in 1907. Her victories came in the One Thousand Guineas, Coronation Stakes, Sussex Stakes, Nassau Stakes, and Yorkshire Oaks. As a broodmare, she is remembered for her daughter Plymstock, by Polymelus. Plymstock became a "blue hen" mare, as the dam of Oaks winner Pennycomequick, Coronation Stakes winner Sunny Devon, American Broodmare of the Year Alpenstock III, and classic-placed Pink Flower. Plymstock was also third dam of Court Martial and dual American classic winner Pensive. Winkipop's son Blink II, by Sunstar, was twice classics-placed, running third and second, respectively, to Gainsborough in the 1918 editions of the Two Thousand Guineas and Derby. 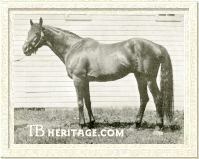 Winkipop's full brother, WINKIE, foaled in 1912, made his name known through the exploits of one horse. Sent to New Zealand for stud duty, he sired a mare named Entreaty, dam of Australia's legendary Phar Lap. 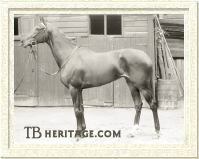 THIRD TRICK, one year older than Winkipop, was foaled in 1906 and was a minor winner. At stud, she became the dam of two good fillies: First Spear, winner of the Park Hill Stakes, and Long Suit, third to Straitlace in the 1924 Oaks. Through Long Suit, Third Trick became second dam of Oaks heroine Short Story. Major stakes winners Mannamead, Amerigo, Hornbeam, Traffic Light, Ambiguity, and Fast and Fair descended from Third Trick. King William Two members of William the Third's 1908 crop were major stakes performers. WRINKLER, out of Stolen Love, by Buccaneer, was a winner of the Prince of Wales's Stakes and KING WILLIAM, out of the Isinglass mare Glasalt, was a winner of the Ascot Derby, Knowsley Dinner Stakes, Duke of York Stakes, and Zetland Stakes and he dead-heated in the Dewhurst Plate, as well as placing third to Prince Palatine in the 1911 St. Leger. As a moderate winner at stud in wartime England, he was not a success as a stallion; his best in England was Holbeach, who was later sent to Brazil. He did get a very good winner in Australia in his daughter Sydney Damsel, whose pregnant dam was imported into that country. Another member of William the Third's 1908 crop was SANDAL. Produced from the Kendal mare Lindal, Sandal was a bad-legged individual. He ran second in the Rous Memorial Stakes and third in the New Stakes as a juvenile, won the Isonomy Plate at three and placed third in the Duke of Cambridge Handicap. He was exported to Argentina with the goal of continuing his racing career there. However, he proved so unsound, the idea of racing him any further was abandoned and he was retired to stud. Sandal did very well as a sire in Argentina, ranking third on the Argentine general sire list in 1926 and 1930 and fourth in 1925. His best representative was the colt Macon. Foaled in 1922, this colt out of the Your Majesty mare Bourgogne, went unbeaten in fifteen races and twice captured the Gran Premio Carlos Pelligrini. 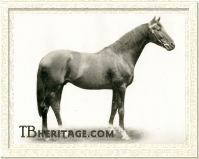 At stud, Macon became a noted sire of broodmares, leading the Argentine broodmare sire list in 1946. Macon had a full sister, Cote d'Or, foaled in 1928, who accounted for several stakes, notably the Gran Premio Carlos Pelligrini and the Gran Premio Seleccion (Argentine Oaks). Muralla, another daughter of Sandal, was a winner of the Gran Premio Polla de Pontracas (Argentine One Thousand Guineas). Sandal's daughter Sierra Balcarce became the first filly to win the Argentine Triple Crown, when she landed the Polla de Pontracas, Gran Premio Jockey Club, and Gran Premio Nacionale in 1930. REMBRANDT, foaled in 1909 from the Amphion mare Miss Repton, did much of his racing in Italy, where he captured the Derby Italiano and Gran Premio di Milano. 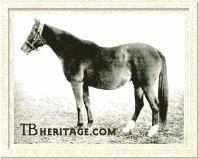 NASSOVIAN was a foal of 1913. He was produced from Veneration, a half-sister to champion Pretty Polly. On the racecourse, Nassovian won the Princess of Wales's Stakes, was third to Clarissimus in the Two Thousand Guineas and third to the filly Fifinella in the Derby. As a stallion, Nassovian served for a time in Britain before being exported to the United States. In America, he sired Champagne Stakes winner Nassau, but little else of much consequence. He did better as a broodmare sire. Daughter Nobility produced Miss Merriment, two-time winner of the Fall Highweight Handicap, and daughter Cicuta, an imported product of his stud career in England, produced Preakness Stakes winner and important sire Display. William the Third enjoyed considerable success as a sire of broodmares, leading the British broodmare sire list in 1922. WILLIA, a 1908 filly out of Gadfly, by Hampton, produced Parth, a Polymelus colt who garnered a victory in the 1923 Prix de l'Arc de Triomphe, second place finishes in the Champion Stakes and Coronation Cup, and a third to Papyrus in the 1923 Derby. 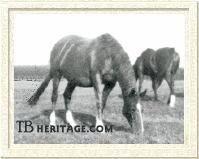 BILL AND COO, out of Coo-ee, by Trenton, was foaled in 1909. She was a hard-knocking racemare, giving gallant performances in the most important races. As a three-year-old, she finished third to Mirska in the Oaks and then ran third to Prince Palatine in the Ascot Gold Cup. As a broodmare, she produced Rackety Coo by Corcyra, who became dam of Irish Oaks winner Cinq a Sept. This filly went on to become the second dam of Imperatrice, foundation mare for Virginia horseman Christopher Chenery. Somethingroyal, a daughter of Imperatrice, produced Sir Gaylord and Secretariat. Beloved, a daughter of Bill and Coo by Whisk Broom II, became the head of a family which produced many good stakes winners, among them Raise a Native, a champion on the track and highly influential sire. ORANGE GIRL, foaled in 1909 and out of the Gallinule mare Fair Nell, became the dam of Tangiers, winner in 1920 of the Ascot Gold Cup. 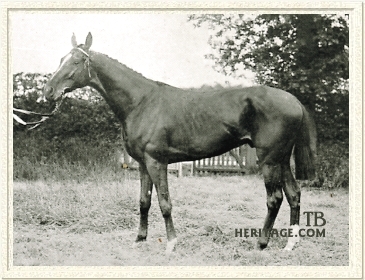 RECTIFY, out of Simplify, by Arklow, was a foal of 1910. Her claim to fame as a broodmare came as the dam of Copyright, a son of Tracery who was victorious in the Ascot Gold Vase. Imported to Argentina by Jorge de Atucha, Copyright became an extremely successful sire, leading the Argentine general sire list twice. He was the sire of Argentine classic winners Camerino, Canicula, Catarata, Cocles, and Congreve. The latter went on to become as high class a sire as he was a racehorse, leading Argentina's general sire list a total of seven times between 1937 and 1945. TRIMESTRAL, out of Mistrella, by Cyllene, was born in 1914. A non-winner on the track, she became the dam of classic-placed filly Trilogy, two-time Ascot Gold Cup winner Trimdon, and Foxhunter, a winner of the Ascot Gold Cup and Doncaster Cup. Foxhunter enjoyed a successful stud career, first in Britain and then in Argentina, and became a noted influence for stamina. His best offspring included Argentine classic-winning filly Foxona, Gran Premio Nacionale winner Swing, Fox Glove, and Fox Cub. The latter two each served stud in Argentina, as well, with Fox Cub leading the Argentine sire list once, in 1949. With the exploits of Trimdon and Foxhunter, Trimestral garnered the rare distinction of being the dam of the winner of the Ascot Gold Cup three years in a row, Trimdon winning the race in 1931 and 1932, and Foxhunter taking the race in 1933. Pamfleta DUTCH MARY, a foal of 1915, was a result of William the Third's union with the champion racemare Pretty Polly. Unlike her famous parents, Dutch Mary could not win, or even place, in a race. Her fortunes changed for the better when she was put to stud. Dutch Mary bred six winners, among them Spelthorne, winner of the Irish St. Leger; Christopher Robin, winner of the St. James's Palace Stakes; Sister Anne, second in the One Thousand Guineas and third in the Oaks in 1929; and Duccia di Buoninsegna. The latter, by Bridge of Earn, was foaled in 1920. She was exported to Italy, having been purchased by Italian breeder Federico Tesio. She turned out to be the best three-year-old filly of 1923 in Italy, accounting for the Gran Premio Regina Elena (Italian One Thousand Guineas) and the Gran Premio d' Italia. As a broodmare at Tesio's Dormello Stud, Duccia di Buoninsegna produced a filly by Clarissimus named Delleana. This filly, too, was an Italian champion, taking the Gran Premio Regina Elena, Gran Premio d'Italia, and the Premio Paroili (Italian Two Thousand Guineas). Delleana proved an exceptional matron, becoming the dam of champions Donatello, Donatella, and Dossa Dossi. Two other significant producing daughters of William the Third were PAMFLETA and MOUNT WHISTLE. Pamfleta, out of Bird I' Th' Hand, by Gallinule, was a minor winner of two races. To the cover of The Tetrarch, she produced Paola, a classy miler who claimed victories in the Cheveley Park Stakes and Triennial Produce Stakes at Newmarket at two and the Coronation Stakes at three. MOUNT WHISTLE, out of Craigellachie, by Wolf's Crag, was a foal of 1916. She became the dam of the Pommern colt Adam's Apple. This colt captured the Two Thousand Guineas in 1927. Found to be affected in his wind, he was sold to the Argentine and enjoyed a successful career at stud. William the Third died on February 2, 1917. For several years prior to his death, William the Third suffered from stringhalt, which made the process of servicing a mare an arduous affair, and his public book of mares was limited to 15. On the day of his death, William the Third was brought out to service a mare, which he did successfully. Only minutes later, the horse lunged, fell to the ground, and died. The cause of death was a cerebral hemorrhage. William the Third was 19-years-old. His body was buried at Welbeck, while his skull was sent to the Natural History Museum, South Kensington.